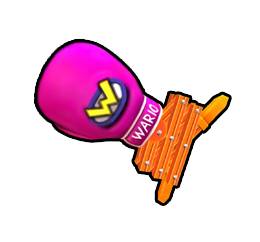 The Stretch Punch is one of Wario's special items in Mario Kart Arcade GP, Mario Kart Arcade GP 2, and Mario Kart Arcade GP DX. The Stretch Punch is an extendable boxing glove. Upon using the Stretch Punch, the user will begin to repeatedly extend it for approximately 5 seconds. If a rival gets too close to the attacking racer, the rival will get hit and be brought to a complete stop. A variant of the Stretch Punch known as the Stretch Punch+ exists exclusively in Mario Kart Arcade GP. This variant extends the duration of the attack by around 2 seconds. The Stretch Punch is the only close-range melee item that has a unique character animation when in use - all other melee items reuse the swinging animation of the Thunder Stick. In addition, the Stretch Punch is one of two melee items to have a unique sound when in use - it plays a spring sound every time it is extended. The other item is the Quack Hammer. This page was last edited on March 4, 2019, at 14:36.